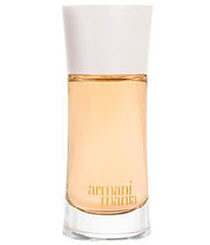 Armani Mania by Giorgio Armani seduces and unleashes a woman’s inner being with this radiant floral fragrance. Sparkling fresh laurel, mandarine, and pink spice is combined with feminine notes of lily of the valley, peony, and contemporary cedar, amber, and musk to create a fragrance that is designed to seduce with simplicity and style. Notes include Laurel, Mandarine, Pink Spice, Lily of the Valley, Peony, Cedar, Amber, Musk.